The Tekken series, perhaps more so than any other fighting game, has a knack for seeking out martial arts disciplines that may be unfamiliar to most gamers and accurately translating them into videogame form with a bit of fantasy flair. For martial artists, having their style of choice included in a major videogame generates exposure and awareness for their particular craft. One such example is Sergei Dragunov, who first appeared in Tekken 5 and returned in Tekken 6 and uses Commando Sambo. "The average Joe - someone who doesn't really have a vested interest in martial arts, someone who isn't the Ã¼ber fan - [still doesn't] know what Sambo is or have a clear picture of it," Stephen Koepfer, the President and Co-Founder of the American Sambo Association, says. "So the fact that there is a character that does Sambo in [Tekken] ... it's pretty cool just for spreading the word, the fact that Sambo even exists - spreading the word to a population of people that are younger. And it's the younger people that are going to keep martial arts alive." Koepfer argues that the evolution of media and entertainment, of which videogames are a major part, has changed what makes martial arts appealing and enjoyable. He cites one of his students, Reilly Bodycomb (whose highlight reel rivals Dragunov's), as an example. "He looks at grappling more like a skateboarder would look at skateboarding: as something cool," Koepfer says. "It's very different from the traditional view that I was raised in, where it's just you and your loyalty to the club and sort of that traditional thing." Slick transitions and sweet combos are attractive to the new generation of martial artists. 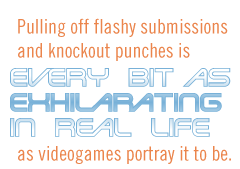 Pulling off flashy submissions and knockout punches is every bit as exhilarating in real life as videogames portray it to be. Koepfer is far from the only martial artist to recognize an inherent connection between videogames and martial arts. Eddie Bravo, a well-known Brazilian Jiu-Jitsu black belt, considered by some to be a revolutionary in the sport, encourages readers of his book, Mastering the Rubber Guard, to think of his system as a videogame. "The more time you spend with this game, the better you get at progressing upward through the levels," Bravo writes. "But just like with any videogame, getting started can often be frustrating because you don't know how to use the tools at your disposal to complete your goals. To keep you from wandering in confusion, I have included the entire player's manual in the upcoming pages."